One way for producers to adjust to the low commodity price environment is through lower variable costs of production. We’ve wrote about this a lot and have found that, to date, fertilizer has been the largest source of cost reductions and early signs show additional fertilizer price relief possible in 2017. Another large variable expense in producers’ budgets is seed. 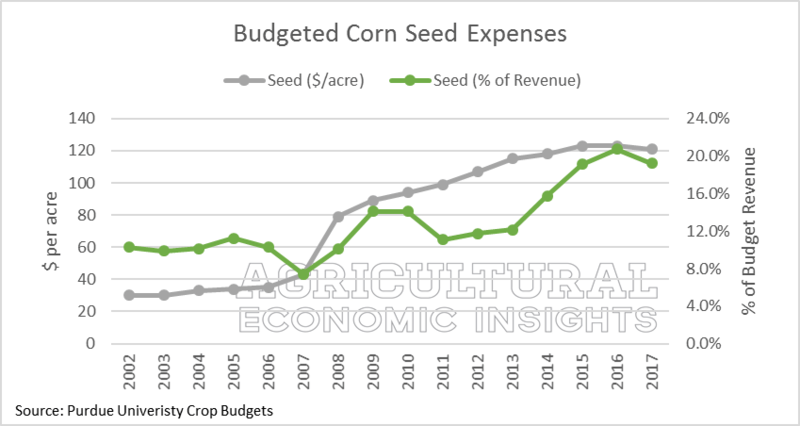 As we’ve wrote about in earlier posts (here and here), seed expense has increased in recent years and accounts for a growing share of total expense. In this week’s post, we take an updated look at the latest corn and soybeans data to see if seed expense trends are defying gravity or starting to adjust lower. The USDA’s ERS tracks and reports cost of production for various crops across the country. In figure 1 the U.S. average corn seed expense is shown in orange from 1970 to 2015 in real (inflation adjusted) terms (2015 = 100). One of the first observations is how dramatically corn seed expense has changed in the past decade. In real terms, corn seed expense more than doubled in just 10 years, from $51 per acre in 2006 to $102 per acre in 2015. The inflation adjusted rate of change is equal to an average, annualized compounded growth rate of 7.9%. It’s also worth pointing out that real corn seed expense was fairly stable at around $40 per acre prior to the run-up. In fact, real corn seed expense was less than $45 per acre for the 29 years prior to 2003. Figure 1 also shows corn seed expense as a share of total expenses (in blue, right axis). 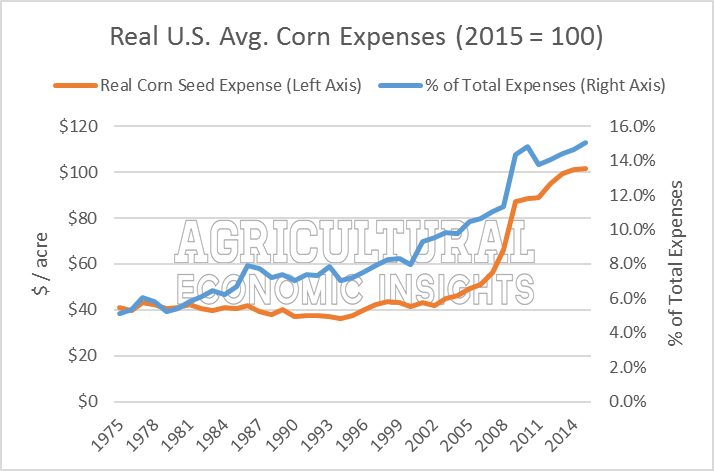 In addition to real seed expense going up per acre, seed expense also has accounted for a growing share of total expenses. In 2015, corn seed expenses accounted for 15% of total expenses, a record level. Ten years before, in 2006, corn seed accounted for 10.6% of total expenses. Figure 1. US Average Corn Seed Expense, 1975-2015. Real Corn Seed Expense (2015 = 100) in Orange (left axis) and Corn Seed Expense as a Share of Total Expense in Blue (rights axis). Data Source: USDA ERS. In figure 2 the U.S. average soybean seed expense data is shown. In 2015, real soybean seed expense was $60 per acre, less than the record levels set at $64 per acre in 2010. Not shown, nominal soybean seed expense in 2010 was $59.20 and dropped to $55.55 by 2011. Prior to 2003, real soybean seed expense was less than $35 per acre. As was the case in corn, soybean seed has accounted for a growing share of total expenses (in blue). For most of the 1980s and 1990s, soybeans accounted for less than 8% of total expenses. Today, seed accounts for nearly 13% of total soybean expenses. Figure 2. 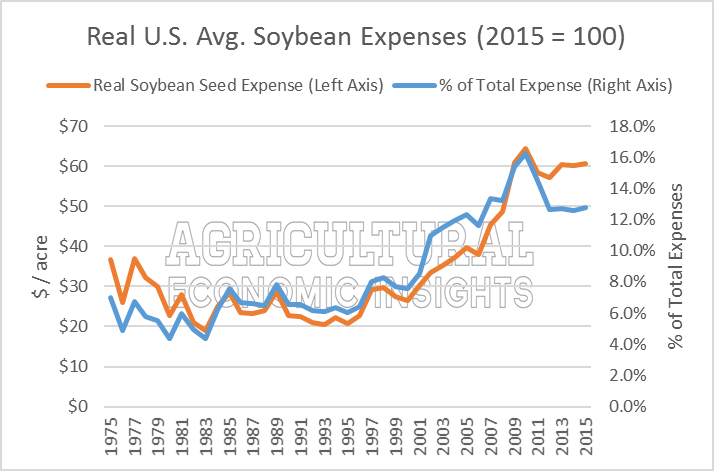 US Average Soybean Seed Expense, 1975-2015. Real Soybean Seed Expense (2015 = 100) in Orange (left axis) and Soybean Seed Expense as a Share of Total Expense in Blue (rights axis). Data Source: USDA ERS. For another look at the trends, the Purdue University Crop Budgets for average quality farmland in Indiana from 2002 to 2017 were considered. In figure 3, the budgeted corn seed expenses data are shown. After several years of large increases, the 2017 budget has corn seed expense at $121 per acre, down from the high of $123 in 2015 and 2016. Spanning 16 years of data, the changes in corn seed expense have been pretty remarkable. In 2002, corn seed was budgeted at $30 per acre. Since then, corn seed expense has increased at an average, annualized growth rate of 9.7%. The other part of the story has been the increase in expected revenue that corn seed expense represents (green, right axis). Prior to 2008, corn seed typically accounted for 10% of budgeted revenue or less. Most recently, this was represented 19% to 20% since 2015. In other words, for every $100 of revenue an Indiana corn farmer budgets, nearly $20 of it is needed to cover current seed expense. Figure 3. Budgeted Corn Seed Expense for Average Quality Farmland in Indiana, 2002-2017. Dollars per acre (gray, left axis) and Share of Expected Revenue (green, right axis). Data Source: Purdue University Crop Budgets. In figure 4 the Purdue crop budget data for soybean seed expense is shown. Like corn, soybean seed expense is budgeted lower in 2017 ($72 per acre compared to $74 in 2016). Contrary to corn, soybean seed expense as a share of budgeted revenue has fluctuated greatly over time. In 2016, a high of nearly 17% of budgeted revenue was hit. Seed expense accounted for a little as 8% of budgeted revenue in 2008 but was as high as 15% back in 2005. 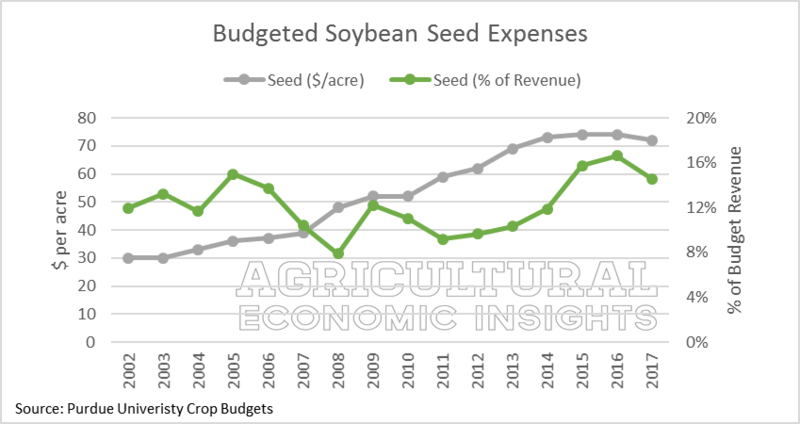 Considering the 16 years of data, budgeted soybean seed expense grew at an average, annualized growth rate of 6.0%, a slower rate than corn. The seemingly small difference in growth rates (9.7% in corn versus 6.0% for soybeans) actually makes a large difference over several years. For example, budgeted corn seed expense for 2017 is 4.03 times 2002 levels while the budgeted soybean expense for 2017 is only 2.4 time 2002 levels. Figure 4. Budgeted Soybean Seed Expense for Average Quality Farmland in Indiana, 2002-2017. Dollars per acre (gray, left axis) and Share of Expected Revenue (green, right axis). Data Source: Purdue University Crop Budgets. It is important to point out seed expense is a function of seeding rates and the prices paid. In an earlier post we discussed changes in corn population and, using a simplified example, illustrated that changes in seeding rates could have a substantial impact on seed expense. Overall, corn and soybean seed expenses have dramatically increased in recent years. After decades of observing real seed expense in fairly tight ranges, current seed expenses are considerably higher (figures 1 and 2). Additionally, seed has accounted for a growing share of total expenses and budgeted revenue. We previously noted the current economic environment seems ripe for a seed manufacture to reduce prices as a strategy to gain market share. While the latest USDA data has not picked up on this yet, budgeted data for 2017 show a small drop in seed expenses on the horizon. The adjustments in seed expense, so far, have been small compared to the adjustments that have comes in fertilizer and cash rents. For instance, the 2017 Purdue budget for corn has seed expense $2 per acre lower than 2015 estimates. Meanwhile, fertilizer has adjusted $36 per acre lower and cash rents are $40 lower over the same 2 years. Many producers wonder if seed prices will adjust lower in the coming years. Without significant changes in store for 2017, producers are likely to carefully consider the hybrids, seed treatments, genetic traits, and seeding rates they pursue.